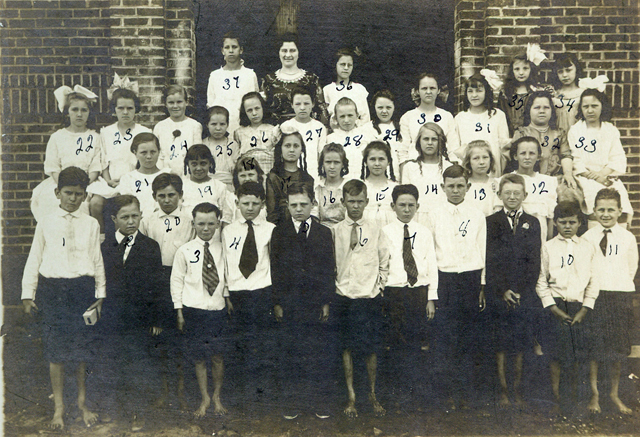 This class above probably is about 5th grade at the College Street School in Hapeville circa 1919. 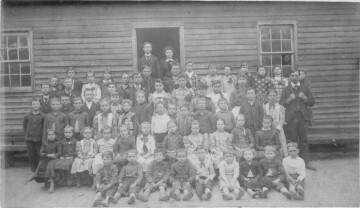 School Humphries Children attended, circa 1889. Numbers written on this photo, probably by Dora Humphries. 1.. Joseph W. Humphries, 2. John D. Humphries, 3. Dora Humphries, 4 J. R. Hardwick, 5 Ned Todd, 6. Mattie Lowe, 7. Arthur Terrell, 8. Lizzie Todd, 9. Pat Patterson, 10. Minnir Harrison, 11. Lillie Lindley, 12. Maggie Lane, 13. Fannie Belle Campbell, 14. Paul Griffin, 15. Ed Griffin, 16. John Lowe, 17. Sallie Lowe, 18. Bertha Todd, 19. Annie Lowe, 20. Eva Sims, 21. Otelia Patterson, 22. Kate Hope, 23. Gus Jones, 24. Morton Butler, 25. Cesie Terrell. Also: Fedna Holland, Maggie Lowe, and Will Harrison. 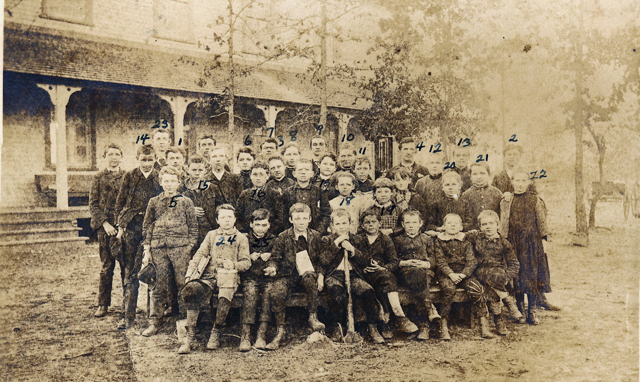 Flat Rock Academy, Clayton County, Georgia, 1891. Teacher, John David Humphries, assistant teacher, Dora Humphries, in doorway. 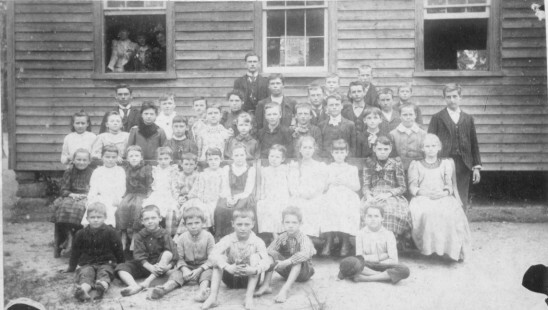 The Flat Rock School began in Flat Rock Baptist Church, near Riverdale Road, two miles South of the City of Manchester, now College Park. At this time, this school had 28 "patrons" who agreed to sponsor the equivalent of 34 pupils, primarily from Clayton County. John D. Humphries had to call on the patrons personally to collect these "accounts." A portion of the financial support came from the Clayton County and Campbell County School Funds because some of the students came from Campbell County. Teacher Humphries traveled by train to Manchester to collect this "voucher" account. 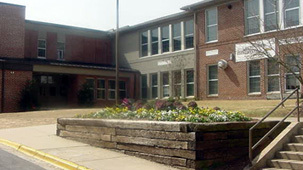 Howard Academy was a school once attended by the Humphries children, John, Joe, and Dora. 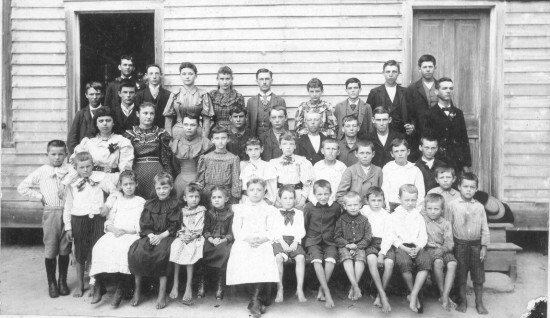 In 1891, when this photo was made, Joseph Humphries was teaching (standing at rear) and Lillie Jones (fourth row from bottom, second from left), who was later to marry John D. Humphries, and her sisters, Laura (second row from bottom, third from left) , and Emma (third row, sixth from left), were pupils. Nellie Bernice Jones was 10 years younger than Laura and attended later. Another school taught by Joseph Humphries. The Jones sisters are not in this photo.